The latest issue of the journal Arbejderhistorie (Labour history) is about class. Several articles deal with class as a theoretical and analytical concept. Others are examples of the use of class in describing and explaining historical and present social phenomena. A complete list of contributions can be found here. I have written the article “Den modern arbejderklasse – bidrag til en skabelsesberetning” (“The modern working class – contribution to a genesis”). It is an attempt to combine a Marxist concept of class with Anthony Giddens’ theory of modernity. I describe how the working class was constituted historically in Denmark and how it came to express its own proletarian form of modernity. The journal is in Danish, but with a short English abstract for each article. 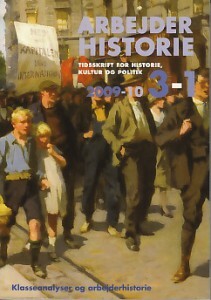 It can be ordered directly from The Society for Research in the History of the Labour Movement.